Why are they doing this? One theory, which I admit possibly plausible, was that Powell simply caved to Wall Street pressure. 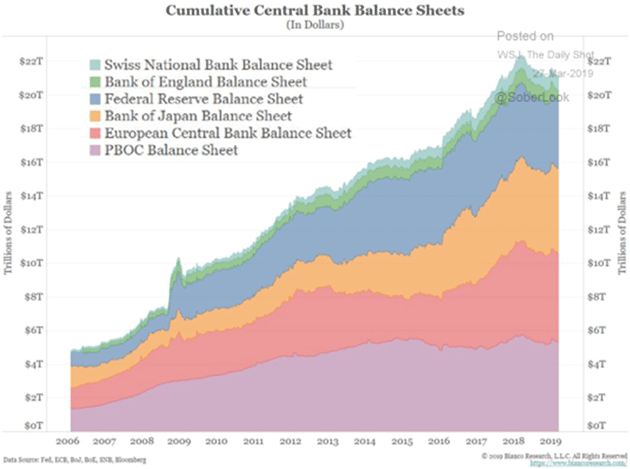 The rate hikes and QT were hitting asset prices and liquidity, much to the detriment of bankers and others to whom the Fed pays keen attention. But that doesn’t truly square with his 2018 speeches and actions. The Fed’s March 20 announcement suggests more is happening. I think two other factors are driving the Fed’s thinking. One is increasing recognition of the same slowing global growth that made other central banks turn dovish in recent months. 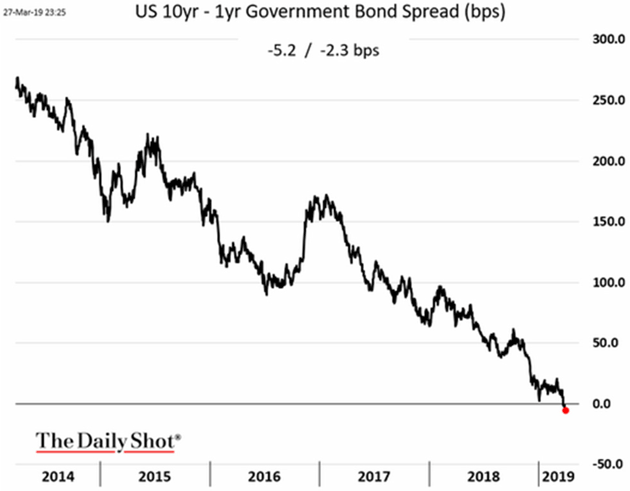 The other is the Fed’s realization that its previous course risked inverting the yield curve, which was violently turning against its fourth-quarter expectations and possibly toward recession (see chart below, courtesy of WSJ’s “Daily Shot”). That would not have looked good in the history books, hence the backtracking. On the second point… too late. The yield curve inverted, and recession forecasts became suddenly de rigueur among the same financial punditry that was wildly bullish just weeks ago. My own position has been consistent: Recession is approaching but not just yet. Yet like the Fed, I am data-dependent and the latest data are not encouraging. Today, we’ll examine this and consider what may have changed. Let’s start with a step back. The global economy clearly hasn’t recovered from the last recession like it did in previous cycles. Yes, the stock market performed well. So has real estate. We’ve seen some economic growth, which in a few places you might even call a “boom,” but for the most part it’s been pretty mild. Unemployment is low, but wage growth has been sluggish at best. Rising asset prices, fueled by almost a decade of easy monetary policy, also contributed to wealth and income inequality, which fueled populist and now semi-socialist movements around the world. This slow recovery began fading in the last few quarters. The first cracks appeared overseas, leaving the US as an island of stability. Not coincidentally, we also had (slightly) positive interest rates and thus attracted capital from elsewhere. This let our growth continue longer. But now, signs of weakness are mounting here, too. That, alone, should tell you that putting your faith in central bankers is probably a mistake. We can’t know how much worse the last decade would have been without their “help,” but does this feel like success? Yet here we are, with millions still in the hole from the last recession and another one possibly looming. We also can’t rely on historical precedent to identify where, when, or why it will start. But we can make some educated guesses. Earlier, I called the US an “island of stability.” Other such islands exist, too, and Australia is high on the list. The last Down Under recession was 27—yes, 27—years ago in 1991. No other developed economy can say the same. 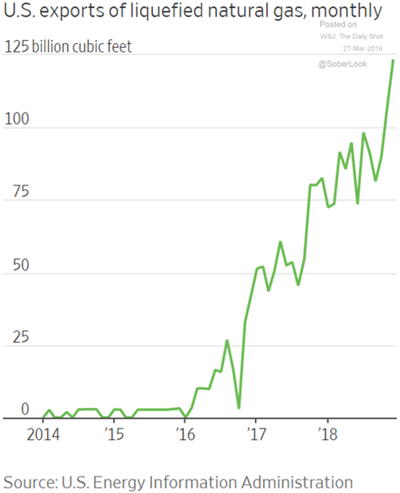 The long streak has a lot to do with being one of China’s top raw material suppliers during that country’s historic boom. But Australia has done other things right, too. Alas, all good things come to an end. While not officially in recession yet, Australia’s growth is slowing. University of New South Wales professor Richard Holden says it is in “effective recession” with per-capita GDP having declined in both Q3 and Q4 of 2018. As often happens, real estate is involved. Australia’s housing boom/bubble could unravel badly. Last week, Grant Williams highlighted a video by economist John Adams, Digital Finance Analytics founder Martin North, and Irish financial adviser Eddie Hobbs, who say Australia’s economy looks increasingly like Ireland’s just before the 2007 housing collapse. Real estate is, by nature, credit-driven. Few people pay cash for land, homes, or commercial properties. So when credit dries up, so does demand for those assets. Falling demand means lower prices, which is bad when you are highly leveraged. It gets worse from there as the banking system gets dragged into the fray. Losses can quickly spread as defaults affect lenders far from the source. This is not only an Australian problem. Similar slowdowns are unfolding in New Zealand, Canada, Europe, and China. It’s a global problem, and one company reveals the impact. Shipping and transport stocks are kind of a “canary in the coal mine” because they are among the first to signal slowing growth. Last week, FedEx reported its international shipping revenue was down and cut its full-year earnings guidance. Its CFO blamed the economy, reported CNBC. FedEx is responding with an employee buyout program and “constrained hiring.” The company is overstaffed for its present requirements. This might also reflect increased automation of work once done by humans. In any case, it won’t help the employment stats. In addition, FedEx is “limiting discretionary spending.” I’m not sure what that means. Every business always limits discretionary spending, or it doesn’t stay in business long. If FedEx is taking additional steps, then whoever would have received that spending will also see lower revenues. They might have to “constrain hiring,” too. Obviously, FedEx is just one company, although a large and critically positioned one. But statements like this add up to recession if they grow more common… and they are. One reason FedEx is in the vanguard is that it’s uniquely exposed to world trade, the growth of which is diminishing for multiple reasons. Part of it is technology. The things we “ship” internationally are increasingly digital, and they travel via wires and satellite links instead of ships and planes. These sorts of goods aren’t easily valued for inclusion in the trade stats. Energy is another factor. Between US shale production and renewable energy sources, we don’t import as much oil and gas from across the seas as we otherwise would. That shows up in both trade and currency values. The US dollar is stronger now, in part because we send fewer dollars to OPEC. Note the massive (and stealthy!) growth in LNG (liquified natural gas) exports in the past few years. Think what this will look like in a few years, with not one but four LNG export terminals on the US coasts. Natural gas is also the basis for much of the chemical and fertilizer industry. Abundant US supplies (and prices less than half the cost of Russian gas in Germany) help many US industries compete. Those are just signs of normal progress and change. The economy can adapt to them. The greater threat is artificially constrained international trade, which is what the Trump administration’s trade war is creating. Last year, I explained how trade wars can spark recession and trade deficits are nothing to fear. I won’t repeat all that here. But we have since seen several market swoons/rallies as harsher trade restrictions looked more/less likely. Whether you like it or not, asset values depend on the (relatively) free flow of goods and services across international borders. Interfere with that and all kinds of assets become less valuable. Starting a trade war, at the same time growth is slowing for other reasons, is more than a little unwise. Agricultural tariffs have already ripped through US farm country to devastating effect, leaving losses some farmers may never recover. The president’s tariff threats had other impact as well. Companies raced to import foreign-supplied components and inventory before the tariffs took effect. This jammed ports and highways last year, not with new demand but future demand shifted forward in time. This is important, and I think we will see the impact soon (if we are not already). Transport and logistics companies geared up for last year’s surge, expanding their facilities and hiring new workers. Importers built up inventory in an effort to avoid tariffs that were supposed to take effect in January. The deadline was extended, but the threat is still alive. At some point, all this has to stop. Carrying inventory is expensive and will eventually outweigh the benefit of avoiding tariffs. Then the boom will come to a screeching halt. Imports will fall as companies work down inventory. All those jobs and construction projects will disappear. That, combined with the other cyclical factors and high debt loads everywhere, could easily add up to a recession. Exactly when is hard to say. Recessions usually get pronounced in hindsight, so there’s some possibility we are in one right now. But I still think we’ll avoid it this year. Getting into this box took a long time and so will getting out of it. Regardless, we’ll have a recession at some point. I think the next subprime crisis will be in corporate debt. Next week, we’ll look deeper into the timing question, what the yield curve tells us, and why the next decade will bring little or no economic growth. I realize this is not a happy conclusion, but I call them as I see them. I’ll leave you with one final but critically important thought: Prepare, don’t despair. Tough times are coming but we can handle them. You have a chance to get ready. I highly suggest you take it. Andy Marshall, who for the last 50 years has often been called the most important strategic thinker you’ve never heard of, quietly passed away last Tuesday at age 97. Starting at the RAND think tank in 1949, he was persuaded to move from California by Henry Kissinger, who wanted his intellect at the White House National Security Council. In 1973, Secretary of Defense James Schlesinger (with whom he worked at RAND) brought him over to the Defense Department to set up the enigmatically titled “Office of Net Assessment.” It was basically a think tank designed to analyze long-term threats and problems and help shape military strategy to deal with them. He was reappointed by every president and defense secretary until his retirement in 2014 at the age of 94. In the 1970s, Andy famously contradicted the CIA and the foreign policy establishment about the strength of Russia’s economy and predicted its collapse. In the 1990s, he quietly circulated his first memo saying China should become the main strategic focus of the US military. Like his Russia analysis, it was ignored at first. Called “Yoda” within the military establishment, Andy’s influence was enormous. I first met him over 10 years ago as he hosted small gatherings of economists and strategists to talk about their views of the future. I would find myself sitting at the table with names you would easily recognize, but for some reason he kept asking me back. He invited me to two of his famous week-long sessions at the Naval War College, where he would mix an eclectic group of thinkers with high-ranking military professionals to consider alternative futures. He asked questions and then put us in a room for 12 hours a day, plus long dinners afterward, to discuss the opportunities and problems the scenarios might entail. It was personally exhilarating and foundational for me. At his retirement party, a former vice president, multiple defense secretaries, abundant military brass, and strategists gathered to honor this singular man’s 40+ years of continuous government service. He spent 65 years focused on keeping our military prepared for the future. I don’t have enough room to properly pay tribute to one of the great futurists of our times. Andy brought the model of competitive thinking that he learned at the University of Chicago to military strategy. He basically invented the arena of inferential analysis. You can read much better reviews of Andy’s career here by his biographer (How is Yoda?) and at the New York Times and Washington Post. His life was chronicled in his biography, The Last Warrior: Andrew Marshall and the Shaping of Modern American Defense Strategy. Just a few weeks ago, Andy again invited me to his apartment near the Pentagon, crammed full of books and journals, to meet with other analysts. Andy was still mentally vigorous and primarily focused on China. There, in his room, the “net assessment” of the potential problems with China were not sanguine. I once asked Andy why he kept inviting me back to his meetings and forums. I truly had no idea. Every time I was in a room with him and the others he gathered, I felt well out of my league. He smiled and said, “Because you don’t think like other economists.” Coming from Andy, that may be the finest and greatest compliment I have ever received. Andy Marshall, requiescat in pace. Starting Sunday, I will basically spend the night in each of the above cities before returning to Puerto Rico. In Cleveland, we will check my eyes, but I can tell you the surgery went very well. I have some last-minute meetings in Chicago (technically Wisconsin), then overnight in Dallas before I fly to Austin, and then Dallas for presentations. Have a great week! Think of a friend or two who you really need to connect with. And then make it happen. With deadlines fast approaching, U.K. lawmakers are no closer to a way out of the EU. The British Parliament’s big swing at taking control of Brexit wasn’t a success, but neither was it a total failure. In nonbinding votes on Wednesday night, legislators rejected all eight options before them, including the existing withdrawal agreement, negotiated with the European Union by Prime Minister Theresa May, and a no-deal departure. Yet two alternatives – a “softer” form of Brexit than the current deal, entailing a closer future relationship with the EU, and a motion demanding that any deal secure public approval before implementation – came close to passing, and both received more votes than the divorce deal has in either of its two ill-fated votes. (The former, which calls for a permanent customs union with the EU on the terms of the existing withdrawal deal, fell 272-264. The latter, known as the “confirmatory public vote” option, was voted down 295-268. May’s deal was voted down 432-202 on Jan. 15, and 391-242 on March 12.) Parliament will narrow its options and hold a second round of votes on Monday. Before the votes on Wednesday, May announced that she would step down if the withdrawal agreement is passed so that someone else can lead the negotiations on the U.K.’s future relationship with the EU. Since then, at least a couple dozen hardline Brexiteers, including prominent figures like former Foreign Secretary Boris Johnson, have reportedly said they would support the deal. That likely won’t be enough – the deal is still probably several dozen votes short of a majority. Still, the government will submit the withdrawal agreement for a third vote on Friday. This is all exactly as insane as it sounds. Lawmakers have started to scramble as the deadline approaches (originally March 29, it is now April 12), but there has been no real progress since the divorce deal was agreed in November 2018 – which was more than two years after the Brexit referendum. The division that has led to the current impasse is not only between Leavers and Remainers but also among Leavers themselves. The majority support that once existed for Brexit – not only in the public referendum but also in Parliament, which voted by a massive 498-114 margin to formally start the process of leaving the EU two years ago – has broken down into so many factions that now not even one of eight options can garner majority support. Separating from the EU is forcing British lawmakers to make some hard choices – choices that could literally lead to the dissolution of the United Kingdom. Save for canceling Brexit, which would come with its own severe consequences for British democracy, there is no scenario – even leaving without a deal – where the U.K. doesn’t eventually have to face these realities. What the British government and Parliament have been struggling with ever since the referendum is how to detach the U.K. from the EU without detaching from Europe. In some areas, this was relatively simple. There was hard bargaining on things like citizens’ rights, foreign and security policy, and the U.K.’s “divorce bill” owed to the bloc, but ultimately these were bargaining chips. 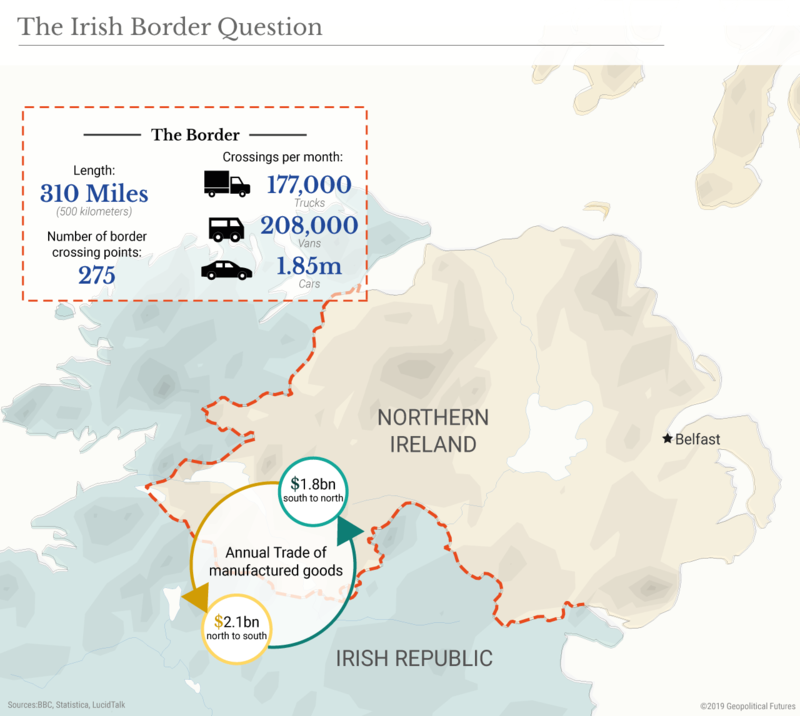 The seemingly insurmountable obstacles are trade and the Irish border, two closely related issues. The key to unlocking a border agreement lies in the final trade relationship. The problem is that trade is the one area where the EU and Europe are synonymous; there is no way to sever links with one and not the other. The European Union is first and foremost a free trade area, and its greatest asset in foreign affairs is its ability to control the ease with which outsiders can access its market. Even without the U.K., the EU would still be the world’s second-largest economy, with a gross domestic product roughly the size of Japan, the U.K., India, Brazil, Canada and Turkey combined. 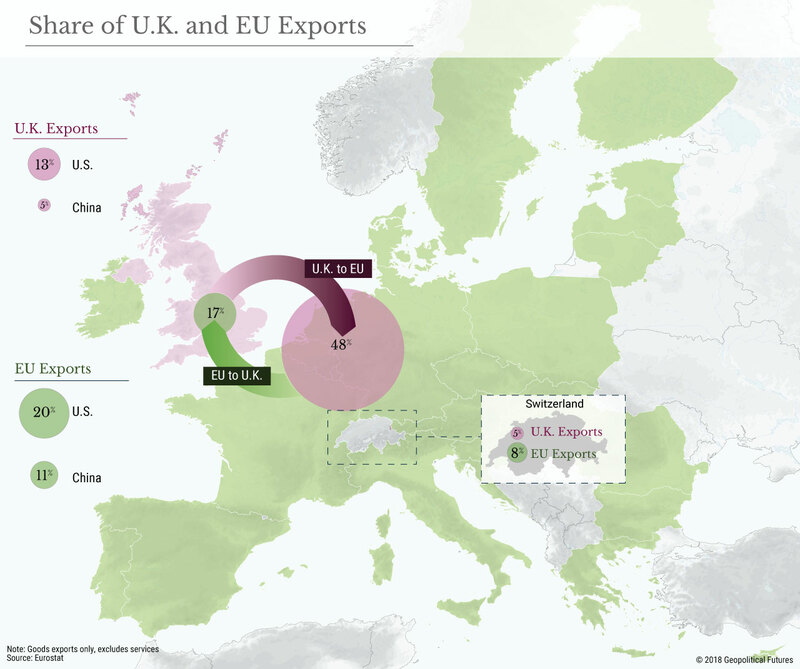 In the first three quarters of 2018, nearly 46 percent of British exports of goods and services went to the EU, worth a total of 214.6 billion pounds ($280 billion), almost 1.5 times more than the U.K.’s next-largest export destination, the United States. The past couple of years have been nothing less than an exercise in myth busting when it comes to the balance of power in the EU-U.K. trade relationship. Take, for example, the trade agreements that the U.K. enjoys with non-EU countries as an EU member. The British government has been working for years to replicate those agreements for post-Brexit Britain, but progress has been slow. The Financial Times reported in February that Japanese trade negotiators were confident they could secure bigger concessions from the U.K. than they did from the EU and thus refused to roll over the recently inaugurated EU-Japan trade deal. In an interview with Business Insider this week, Martin Donnelly, the permanent secretary of the U.K.’s Department for International Trade until 2017, became just the latest expert to warn that future British trade deals were likely to include less favorable terms than existing ones. The United States, which does not have a trade agreement with the EU, has set tough expectations for its own trade deal, including “comprehensive market access for U.S. agricultural goods.” This is typical for negotiations, but that’s the point: Trade talks are brutal, the EU can offer access to a vastly larger consumer market and thus invariably has more clout in negotiations, and the U.K. won’t get special treatment even from Washington. Then there’s the Irish border. Right now, because both the Irish Republic and Northern Ireland are in a customs union and single market, trade goods can move freely between them. But the EU contends that without those conditions, trucks will need to be stopped and inspected. This poses a threat to the Good Friday Agreement and the fragile peace that has existed between Ireland’s Unionists and Republicans for three decades. Simply put, that peace depends on the illusion of no border, and the fear is that anything that hints at separation will be a target for violence. The answer that negotiators arrived at was the Irish backstop, which effectively would mean that Northern Ireland would remain in a European customs union and stay aligned with single market rules no matter what. The backstop would cease to apply should the U.K. and EU come up with “alternative arrangements,” namely some sort of technological solution that obviates the need for formal checks or physical infrastructure, but such a solution is as yet undeveloped and probably years away. Though Northern Ireland’s Department for the Economy has concluded that the backstop would be a boon for foreign direct investment in Northern Ireland, the ruling Democratic Unionist Party despises the idea. Being stuck applying EU tariffs and following EU regulations, just like the Irish Republic, while the rest of the U.K. floats away is seen as a stepping-stone toward Irish reunification. And without the DUP’s votes, the withdrawal agreement does not have the numbers to pass in Parliament unless it gets significant support from the opposition Labour Party – an unlikely prospect. Were it not for the Irish question, resolution would be easier. But not by much. There is still a deceptively hard decision to be made over whether to prioritize business interests through close ties to Europe or greater autonomy through a U.K.-EU free trade agreement. Every advanced European economy has had to make this decision at some point, and all of them chose either full EU membership or participation in the single market (Norway, Switzerland, Iceland and Liechtenstein), which means they obey rules set by EU member states on things like food standards and competition. Most Brexiteers resist the single market, preferring instead a comprehensive free trade agreement. And that’s where Northern Ireland invariably comes up again, because it’s the EU’s relative strength on trade that enables it to make the Irish backstop a permanent feature of any future arrangement – even a free trade deal. Worse still, no deal is not in itself an endpoint; like the withdrawal agreement, it is merely a transient stage while working out the future relationship – just a much more chaotic transition. Once out of the EU’s customs union, the British government would be free to negotiate its own free trade agreements with non-EU countries. At some point, however, it would desire a trade deal with the bloc that accounts for almost half of all British trade. The realities of the balance of power, and of the Irish border, would not have changed in the intervening period. In fact, if prevailing economic impact assessments are accurate, the U.K. will be returning to the table after having been through much worse than the EU collectively. This is the crux of the matter. Leaving the EU is easy. Trade negotiations are hard. And for a European power, even one like the United Kingdom, breaking up with Europe is imposible. Theresa May's Days Are Numbered. Now What? Even if British Prime Minister Theresa May's last attempt to get her much-maligned withdrawal agreement through parliament succeeds, she is unlikely to keep her job. But whoever comes next probably won't manage to defuse the crisis. Boris Johnson recently had his hair cut short. In the past few weeks, he has visibly lost weight. He has even learned to hold his tongue. When the former British foreign secretary left parliament in Westminster last Tuesday, he was, as always, confronted by journalists. But the man who otherwise never avoids a microphone pushed his ski hat down and walked off. Since then, London's political pundits have been convinced that Johnson is up to something. They claim he's merely waiting for the right moment to catapult himself back into the spotlight. That day, it seems, is not so far away. After another bruising week in the United Kingdom, the end game has started. Not only for Brexit, but also for the prime minister. Theresa May herself pointed out in front of parliament on Wednesday that her days as prime minister might soon be numbered. That much was already clear to anyone who saw Theresa May's unabashedly populistic televised address on Wednesday, with which she tried to deflect any blame from herself. Or who has read her listless letter to European Union leaders, in which she almost beseechingly requested an extension to the misery. Or who has listened to her level-headed fellow party member Dominic Grieve, who said that, because of her, he has "never been more ashamed to be a Conservative." "She may stagger through London for another few months," says a long-time ally, predicting that, even if she manages to push through the widely hated withdrawal agreement at the last moment, "she can longer save herself." During the biggest crisis in postwar United Kingdom history, many leading politicians are ever more blatantly positioning themselves to succeed May. This includes a handful of incumbent ministers, who should have their hands full preventing their country from drifting into chaos. It reflects the situation's core problem: While Brexit is a foreign-policy issue for the rest of Europe, in London it revolves primarily around a battle for domestic power. Backstage at Westminster, a shameful performance is taking place. No matter what happens, everything suggests that this power struggle will make the perpetual-motion machine that is Brexit harder to solve. Considering the way things are going, the second phase of negotiations with the EU -- should they, at some point, occur -- will likely be carried out by a Brexit hardliner. Europe needs to prepare itself for the worst. Former Brexit Minister Dominic Raab was among the first to put himself up for May's job. At a conservative think tank in mid-March, the shrewd 45-year-old gave a speech about "unleashing the great British underdog." His supporters launched a Facebook page called "Ready for Raab." Its appeal, however, has remained modest. Thus far, only 114 people have become fans. Foreign Secretary Jeremy Hunt and Home Secretary Sajid Javid have been subtler. Both were recently seen in the government quarter apparently wooing members of the party over breakfast or a glass of wine. Both are supposedly recruiting employees for an election campaign. And both are trying, somewhat clumsily, to rid themselves of their moderate image to appeal to their party's right-wing margins: Hunt by comparing the EU to the Soviet Union, Javid by denying a British woman who joined Islamic State the right to return home from Syria. But the fact that the 19-year-old recently lost her newborn in a refugee camp dealt a heavy blow to Javid's leadership ambitions. Suddenly the home secretary, the first Muslim to have one of the country's top posts, seemed like a heartless technocrat. Aside from Raab, Hunt and Javid, at least six other prominent Tories have been ogling the move into 10 Downing Street. The Times of London wrote that it was May's own fault that countless backbenchers were seriously considering running as her successor. It quoted a conservative lawmaker as saying that the prime minister's questionable performance had made others believe they would be suitable for the office as well. But Boris Johnson is considered the most likely to land the position. The fact that the former leader of the Brexit campaign seems to embarrass himself every time he opens his mouth doesn't seem to bother a large contingent of Conservative voters. On the contrary. People look up to the 54-year-old when he describes Muslims as looking like a "bank robber" or "letter boxes," or when he claims money spent solving old child-abuse cases was cash "spaffed up a wall." This week, several female Tory lawmakers said they would prefer to leave the party than serve under Johnson. But the party base, which has drifted to the right during the Brexit years, would doubtless vote for Johnson. They love him for his vision of a "glorious future" for a UK, that, once free of the EU's shackles, will find its way back to greatness. It's not clear if Johnson will ever be able to demonstrate how that is supposed to happen. According to Tory party statues, it is up to the parliamentarians to reduce the number of applicants in a multi-stage voting process. The base would then be allowed to vote between the two remaining candidates. Boris Johnson, who is good at talking but less good at maneuvering, will thus carefully consider his behavior in the coming days and weeks. And he will have to find a way to help topple May without too much blowback falling on him alone. Even if May emphasized this week that, as "prime minister," she will not go along with a years-long delay in Brexit, it is unlikely she will go of her own accord. However, her room to maneuver has, since the end of this week, shrunken to a minimum. Early this coming week, May will make what will presumably be her last attempt to force the withdrawal agreement she negotiated with the EU through parliament. If she succeeds, the EU will reward her country with several weeks of additional time to implement Brexit technically. If that happens, May will become the person who carried out the UK's divorce from the EU. But hardly anyone believes this would save her. A member of London's political apparatus said, "Maybe she will experience another honeymoon -- but it wouldn't last more than three minutes." Only a small minority believe that May's situation will really change after a third vote. It's much more likely that, in the coming week, parliament will hand her a third, and final, defeat. After that, the lawmakers would then take de facto control of government business to avoid a no-deal scenario, one that would be grim for all of Europe. The United Kingdom would need to ask the EU as soon as possible for, likely, a nine-month, but possibly a two-year extension of the Brexit deadline. At the EU summit on Thursday, several heads of state ruled out that possibility -- but nobody believes that, if worse comes to worst, the EU would actually push the UK off the cliff. EU chief negotiator Michel Barnier recently named the price for a generous extension: The United Kingdom and Northern Ireland need to be willing to tie themselves much more tightly to the EU than had previously been planned, and stay in the common market and in the customs union. Alternatively, according to Barnier, London could carry out a new election or a second referendum. It seems impossible that any of these scenarios could be carried out while Downing Street's current stubborn occupant remains in power. She has bound her fate too tightly to her deal. If Theresa May doesn't step down at that point, at the latest, the opposition will likely engineer another vote of no-confidence. This time, however, there might be enough rebels among the Tories to help push her out of power. In Downing Street, many are counting on the end being nigh. Tory parliamentarians are comparing the situation there, in all seriousness, to Hitler's last days in his bunker. Few believe the Brexit problem will be easier to solve once May is out of office. "Whoever is Conservative leader after Theresa May -- Henry Kissinger, Nelson Mandela, Donald Trump -- Britain will still be in the same position, with a relatively weak negotiating hand facing a fairly united negotiating partner," columnist Daniel Finkelstein wrote in The Times of London. That is especially relevant if the successor's name is Boris Johnson. During his three years of Brexit machinations, the former Brussels correspondent has revealed a shocking ignorance of the way the EU functions. His recommendation was always to stay hard so the EU would give in. So far, though, that strategy hasn't panned out. People in Brussels are concerned they will have to tolerate the unpredictable political lunatic during the highly complex second phase of negotiations centering on the future relationship between the UK and the EU. Moderate Brits are also worried about "BoJo." In any case, they can't expect him to by any better at bridging the deep gaps Brexit has dug in the country. Parliamentarian Anna Soubry recently put it this way: If Boris was to take over, "then God be with us." Note: I have received a staggering number of comments from readers on the first two installments in this series. As most of you know, we at GPF try to answer all of the emails we get from our readers. In this case, that hasn’t been possible. So instead, I will devote next week’s installment to addressing some of the comments I received on the first two articles, particularly the second one (many were uncomfortable with my deterministic approach to geopolitics). Important points were made, and I will address as many as I can. Now on to today’s topic. The purpose of a geopolitical model is to provide a framework for understanding how the international system works. The model doesn’t have to be global or formally mapped out. Thucydides’ model of how Greece worked drew a distinction between coastal cities like Athens and landlocked cities like Sparta and the way in which they interacted with each other. But who we are and when and where we live define our geopolitical views. For example, until the European age of exploration, those who lived in the Eastern Hemisphere didn’t know a Western Hemisphere existed. After the Europeans gained contact with the Americas, the geography of both hemispheres stayed the same, but the way people experienced that geography changed dramatically. Discovering the underlying order in the geopolitical system gives order to the political decisions made by nations. But this order is not permanent. It shifts as power shifts. The most radical change in the 20th century so far has been the dramatic increase in the importance of North America, in general, and the United States, in particular. That shift has made the three prior models – formulated by Halford Mackinder, Nicholas Spykman and Karl Haushofer – obsolete. 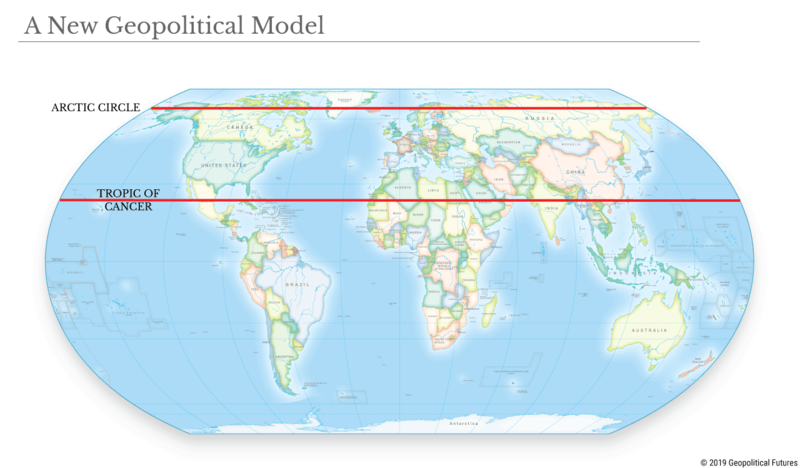 I’m proposing a fourth model that will provide a more useful perspective on the world. But first, we need to outline the three theories that brought us to this point. Mackinder, an English geographer, established the most famous geopolitical model in 1905. His focus was in trying to explain how Eurasia (a combination of Europe and Asia) worked. He referred to it as the World Island, which was the center of the global system, and labeled the center of the World Island the Heartland, which was essentially the Russian Empire. The Heartland was surrounded by the Inner or Marginal Crescent (what Spykman later called the Rimland), which included the European Peninsula, the Middle East, India, parts of Southeast Asia and East Asia. According to Mackinder, whoever controlled the World Island would control the world. The sea surrounding the World Island was a dimension over which the nations of the Rimland struggled, and in that struggle, they gained or lost power within the Rimland and, therefore, over the Heartland. This model explained Germany’s obsession with Russia, the competition in Europe among major powers, and the British and French concern with the Middle East, India and Indochina. What the model excluded was the United States, which was about to burst into the Rimland with a million troops to settle World War I. During World War II, Spykman, an American geographer, created a model that countered Mackinder’s. 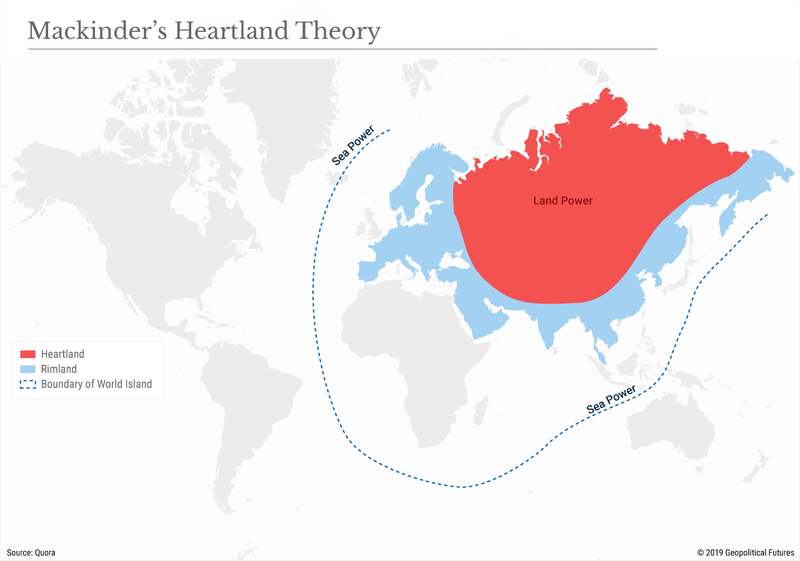 He kept Mackinder’s core model intact but included the United States, which projected power over the Atlantic and Pacific, and de-emphasized the importance of the Heartland. The nations of the Rimland faced each other while the Heartland was passive. He also de-emphasized the Soviet Union, which was understandable considering when Spykman designed the model. The nations of the inner rim were forcing themselves outward, while those of the outer rim were trying to contain them. In effect, Spykman had accepted Mackinder’s model but modified it to account for the changing dynamics produced by World War II. The U.S. was projecting power into the World Island but was itself still marginal. Spykman continued to assert that whoever controlled Eurasia would control the world. But with the collapse of the Soviet Union, command of Eurasia was even harder than before and the U.S. strategy of containment (i.e. 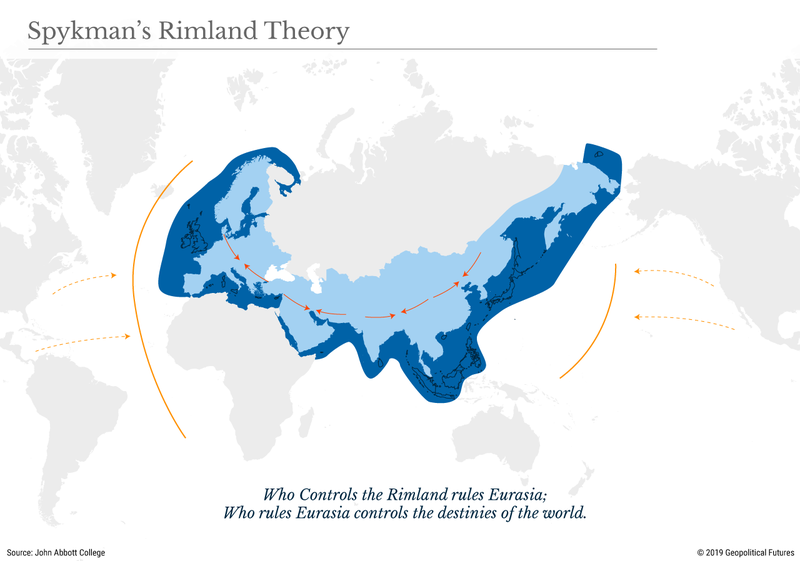 controlling the Rimland) no longer absorbed U.S. interests. The third theory was developed by the German geographer Haushofer. His model had the advantage of trying to create a balanced view of the world and the disadvantage of being formulated by a Nazi as a rationale for German expansionism. Haushofer’s model divided the world into four distinct blocs: the U.S. zone, which was essentially the Western Hemisphere; the German zone, which included the European Peninsula, Africa and much of the Middle East; the Russian zone, which stretched from Eastern Europe to Siberia but didn’t reach the Pacific; and the Japanese zone, which included East Asia, the Asian Archipelago and Australia. Interestingly, India is included in the Russian zone, but its status is ambiguous. It was a model that Haushofer believed would form in the future, but it never did. Germany couldn’t hold Europe. Japan couldn’t control East Asia. Its biggest pitfall was the assumption that the United States was oriented toward its south and blocked from the Atlantic and Pacific. In fact, the U.S. came to dominate the Atlantic and Pacific, no European power retained a southern hegemony, the Soviet Union moved deep into Europe, and Asia fragmented. With all these models now obsolete, a new, less ideological one is required. The geopolitical challenge we have is to create a model that incorporates global power into a single system. The portion of the Northern Hemisphere between the Arctic Circle and the Tropic of Cancer incorporates the world’s major powers and the most significant nations. Some important regions, including Australia, Brazil, the southern part of India and parts of Southeast Asia, lay outside this band, but the boundaries I am drawing have some flexibility. 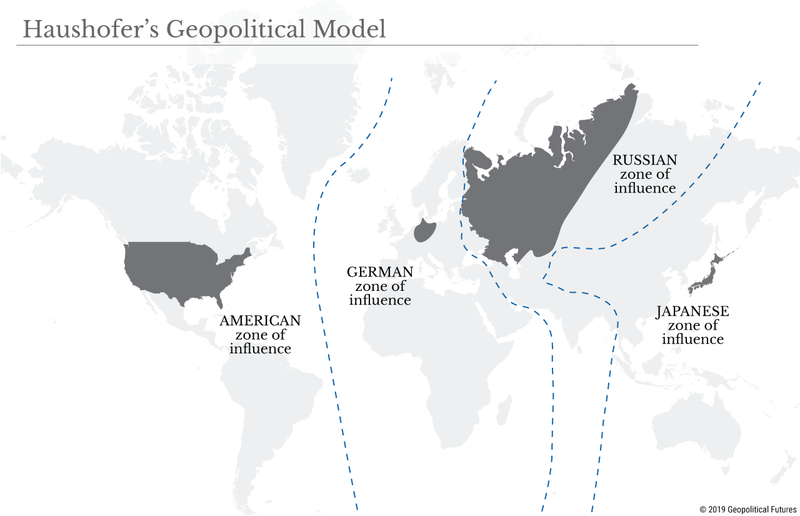 This model shows the east-west pattern of geopolitical interactions. The United States interacts with China to the west and Europe to the east. Russia and Europe interact with each other. It therefore moves away from the World Island model and allows the center of the system to shift as power balances change. Most important, it elevates the oceans to an appropriate level of importance. In this model, the North Pacific and the North Atlantic are critical as they facilitate east-west trade and are arenas of potential conflict. For now, the U.S. is at the center of the model because of its access to and command of the Atlantic and Pacific oceans. The model is also faithful to dominant international trading patterns. I want to emphasize that such models are useful but not critical. They don’t affect national strategies, since leaders are already aware of the shape of the global system. They do, however, make it easier to understand national strategy and the marginalization of some countries.